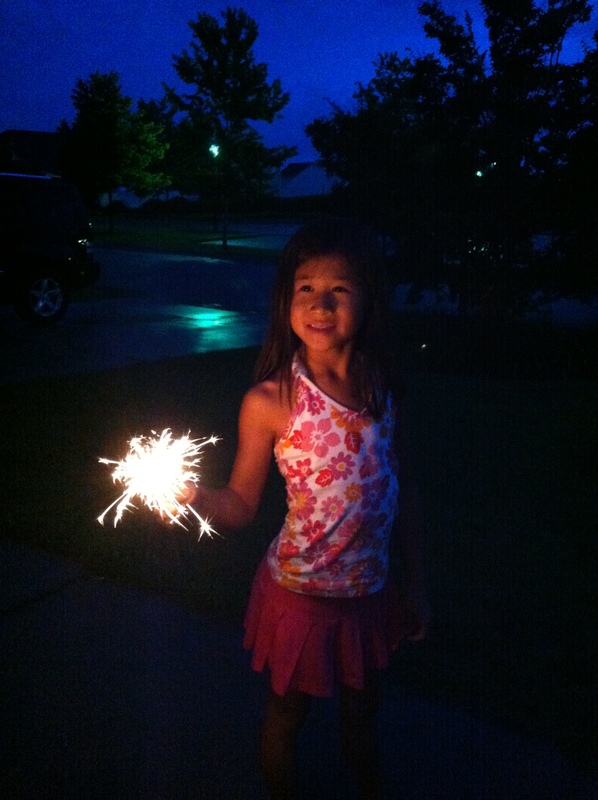 This is my lovely youngest daughter on July 4 of this year. She’s sweet and spicy, and full of energy (and totally posing for this shot). This photo was taken on our front porch because it was raining off and on all July 4. She was sorely disappointed because we weren’t able to go see any of the big local fireworks shows – they were all cancelled or rescheduled due to the weather. Normally some of the people in our neighborhood shoot off fireworks on their own (it’s not illegal in our county) but again, the weather was keeping most people home. I had bought sparklers and “poppers” for the girls to enjoy and they insisted on using them, so during a brief break between showers we went onto the front porch and lit some sparklers up. The phrase “Curiosity killed the cat” doesn’t exist for nothing. My baby girl (she’d be mad if she knew I called her that, but she’s always going to be my baby. There’s no help for it.) is the most curious of my girls. She asks more questions than the FBI and she never seems to run out of words. Or questions. She’s usually nervous around fire and sparklers because she fears her clothes or hair catching fire. But on this night she thought it would be interesting to touch the sparkler. While it was lit. Just to see what it felt like. I’m not sure what she expected, or why she didn’t connect sparks=fire=hot, but one minute she was holding the sparkler normally and the next she was showing me her blistered fingers. Her curiosity didn’t kill her but it bought her some pretty deep burns on three of her fingers, and as a very active gymnast it was not fun working out while those burns healed. And yet. How many times have I satisfied my curiosity at the expense of my own health? Maybe not just my physical safety, but emotional health, or spiritual health. I’m not usually physically adventurous, but how many times have I looked at/watched/read something that was damaging to me, just because I was curious? A wise person once told me, “Once you’ve seen something, you can never un-see it.” And it’s true. It becomes a part of you, for better or worse. There are things I’ve read and seen that I wish I could take back but I can’t. The burns are healed now but maybe the scars they left behind will help her be more cautious the next time her curiosity urges her to act. I hope I can say the same for myself. Today I’m linking up with http://www.crystalstine.me for Behind the Scenes, a fun little link up where we tell the stories behind all those Pinterest-worthy photos. It’s time once again to write wild and free with www.lisajobaker.com and the Five Minute Friday crowd. Broken. It’s how I felt that chilly day in October 1991 when a man who once promised to love me until death do us part walked away without a backward glance. It’s how I felt the first time a life barely begun slipped away from us. And the second time, and the third awful time. Broken. I don’t like that feeling because I like to be in control. In control of my emotions, my plans, my LIFE, and that brokenness of my spirit reminds me that I am absolutely not in control. God’s grace is most evident in my life during the broken times. Perhaps it’s true that we are stronger in the broken places, because it’s then that we are relying on His power instead of our own. We buried my father-in-law last week, a man I had met only a handful of times. It wasn’t due to any family tension or estrangement that I didn’t really know him. It was because he had been incapacitated by mental illness for the past 25 years. By the time I met and married his son, my father-in-law had been in full-time nursing care for over 6 years. I snapped this picture when we arrived very early at the cemetery for the service so I guess the Behind the Scenes part is that you can’t see the funeral tent behind me and to my right. 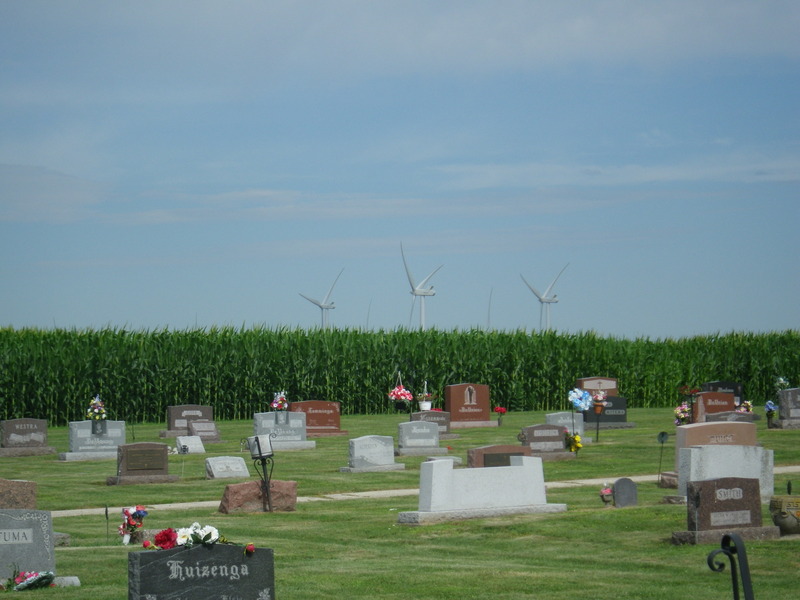 I was struck by the juxtaposition of the gravestones against the corn field against the windmills in the background. This is Wisconsin – there are corn fields everywhere – but I liked the way this one butted right up against the cemetery. Yes, people die and are buried, but the ones who are left need to eat, hence the corn. Life goes on, right there in the face of death. And speaking of the service, it was conducted by a young female minister from the local Methodist Church who said some things that really struck to the heart of me, so much so that I’m still processing them. Also during the service she read some loving words put together by my husband, the youngest of three sons, about the legacy of his father. My man is not a writer by any means, but what he wrote for his father’s funeral was very heartfelt and meaningful and applies to so much of life. He said that he is choosing to remember the good things, the things his father did right in life, and that whatever else could be said of his dad, he did manage to raise three wonderful sons who are his true legacy. I hope one day that my three daughters will be able to say that about me. That they choose to remember me for the good things I did and the things I did right. Today I’m joining up with the rowdy crowd over at www.crystalstine.me for our Behind the Scenes link-up, where we share the stories behind the pictures. Today I’m linking up with the Chasing History crowd on It Just Takes One for our series on Women in the Bible. Today I’ve chosen a woman close to my heart: Martha. I used to think I was bossy. I’ve always been the one who likes to be in control, who would rather make a wrong decision than no decision, a person who values action. And then I stumbled on Florence Littauer’s book The Personality Tree and took a Training Union class on it. (If you weren’t raised Southern Baptist you might not know what Training Union is. Basically it’s like Sunday School except on Sunday nights.) That’s when I discovered that God made me this way. That my tendency to want to get things done and my practical nature were both inborn traits and that my Choleric personality has its good and its bad aspects. I have always felt and continue to feel that Martha gets a bad rap in these verses, maybe because we have so much in common. I understand that Luke was using the difference between the sisters to make a point, which I’ll get to in a minute. But I’d just like to point out that without Martha’s hardworking, get ‘er done nature, her guests would have had to wait for their meal, if they in fact got it at all. Yes, maybe Martha was getting all riled up over some things that weren’t necessary (ironed tablecloths, perhaps) but a certain degree of preparation is necessary when you have houseguests. Am I right, or am I right? Today I want to point out three observations about Martha and how they relate to spiritual gifting, and next week I’ll write about another episode in Martha’s life. I’ve had houseguests before, and if you think caring for your family on a daily basis is a lot of work, adding several others into the mix sure doesn’t simplify things. There are so many things to think of: sleeping arrangements, meal plans, making sure there’s enough tissue in the bathrooms, etc. And in Martha’s day there was no calling up to have pizza delivered for the crowd. So by being hospitable to Jesus and his disciples, Martha was willing to take on a huge job and it probably wasn’t the first time she’d done it. At our house, we love having people over for dinner or games or whatever. It’s extra work but the community and developing of relationships are so worth it. Secondly, Martha had a highly tuned sense of justice. Basically, in verse 40 when she says that Jesus should tell Mary to help her with all the prep work, she’s repeating the refrain of every 4-year-old in the history of ever: It’s not fair! Oh, Martha, I can so relate to you! I tend to see situations in black and white with very little gray area (that’s due to my spiritual gift of discernment) and most of the time a thing is either right or it’s wrong. No situational ethics problem here. One of the hardest things I’ve had to do in my adult life is accept the fact that life is just not fair, and to realize that God never promised it would be. In fact, He told us we’d have problems. John 16:33 says (in part): “In this world you will have trouble. But take heart! I have overcome the world.” So why are we surprised when things don’t go our way, when the “good guys” get stomped and the “bad guys” seem to be getting everything they want? It’s because deep down, our inner kindergartner still thinks life should be fair. 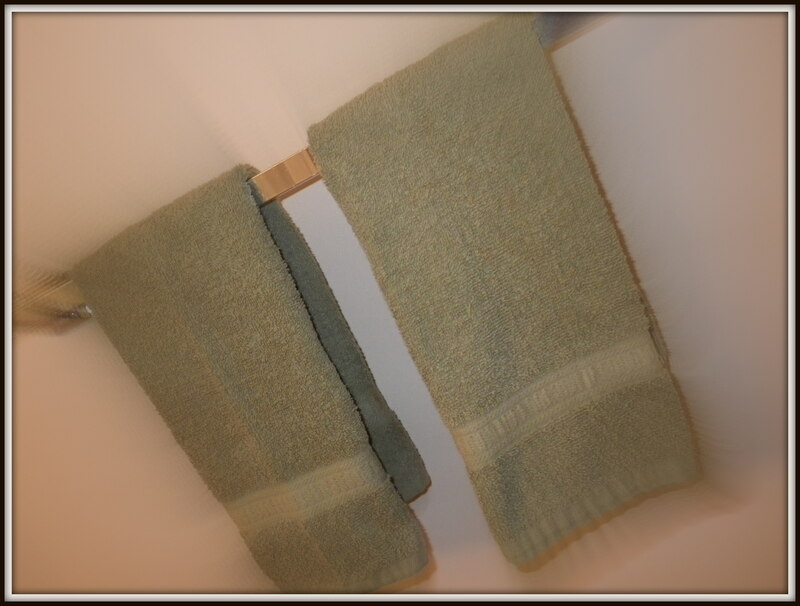 And lastly, Martha cared about the details and she wanted to get it right. In verse 41 Jesus tells Martha she is worried and upset about many things, and He’s correct, of course. I picture her trying to set the table and counting heads to see how many plates she needs, and meanwhile there’s her sister just sitting there, listening to Jesus teach. I’m sure Martha would have liked to sit and listen too, but somebody has to get the house ready for all these people since it sure isn’t going to be Mary. Or maybe I’m projecting. Clearly I feel an affinity with Martha. I think Martha has the spiritual gift of service, and I’d go a step further and propose that it might also be her love language. I believe she thought she was showing love to Jesus by taking care of His practical needs. By the way, have you ever noticed that when you do something in love, it isn’t always received as love? And have you ever noticed that you always expect other people to feel the same way you do? It’s pretty self-centered, if you think about it. Why don’t you feel the same way I do? (verse 40: “Lord, don’t you care…”?) Don’t you see what I see? And the simple fact is, we don’t see things the same way, we don’t feel things the same way, we don’t understand things the same way, because we are not the same person. I think that idea could take on a life of its own. Maybe it needs its own post. Luke paints it as one sister is the “good” one and doing the right thing, and the other one is the “bad” one, getting all crazy over place settings. I think we know who is who in that scenario. Luke doesn’t tell us what happened next because he’s made his point. But here’s what I like to think happened: Martha hung up her dishtowel and sat down next to Mary, where they both listened to Jesus teach with open hearts, soaking up every word. Then, when He had finished, Martha and Mary got up and finished the chores together. Because isn’t that the kind of thing He would teach them – that in community we share the work? Sit and listen to Me first, then go and work together, showing each other the love that I’ve shown you. Because what I get from this is not that housework is “bad” (boy, don’t we wish!) but that we need to let the first things be first in our daily lives. It’s a cliche, but starting the day with Bible study and prayer – time spent with our God – really does make the day go smoother. It sets the tone for everything else. And yes, a clean house is nice, but it shouldn’t come at the expense of worshiping Him. Next Monday: More about Martha! I’m taking 5 minutes before my day gets all crazy to write because it’s my favorite day – Friday! I’m linking up with some of the best writers on the ‘net at www.lisajobaker.com to write wild and free on a one-word prompt. Today it’s Belong, one of my favorite words. I used to think I knew where I belonged. In high school, I belonged with the slightly nerdy chorus and drama kids, and if you further distilled that group, I belonged with the MHS Singers who were above average in their test scores. That’s where I fit, because you know that in high school it’s all about what box you’re in. As a somewhat mature adult I know now that boxes are not for people, they’re for lovely presents in the mail, and I don’t just identify myself by what I do anymore. When I moved to South Carolina from Tennessee a few years ago, I had a long period of time when I felt like a fish out of water. I’d lived in Tennessee my whole life! Sure the accents were the same, the weather was the same, but nothing else was. For the first four years if you’d offered me a chance to move back to Tennessee I would have jumped at it. But now South Carolina is my home. The people there have welcomed us in like family and I know it’s where we belong. And then there’s this online community that I’ve found. The people are real, even though I’ve never physically touched any of them. They’re open about their struggles and it lets me know it’s OK for me to be open too. They’re encouragers, lifting me up in prayer and cheering me on when I doubt myself. They’ve opened their virtual arms and welcomed me in to the party, and it feels like fitting the very last piece into a 1000-piece jigsaw puzzle: satisfying and fulfilling, and now I’m able to see how I fit into the bigger picture, at least a little bit. I know what it means to belong, and I want to help others know that blessing. Now it’s your turn! Come play along and show us what you’ve got! 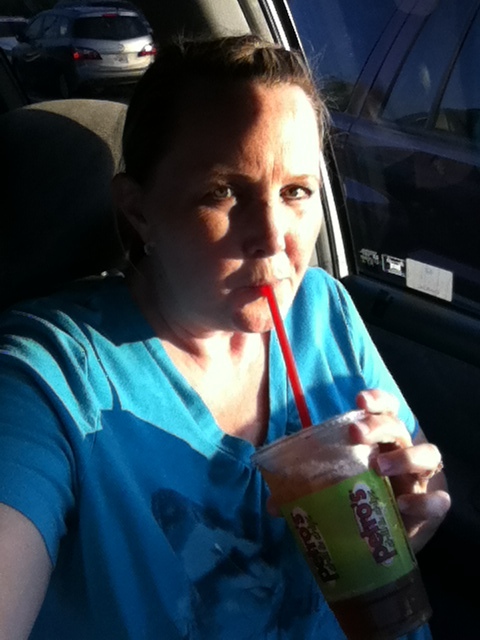 So a few days ago I tweeted this photo of myself drinking a Petro’s iced tea. 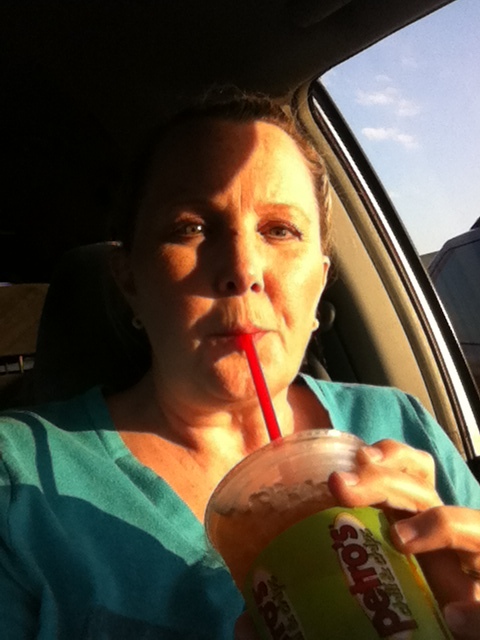 I was visiting my hometown for the day and one of my online friends who has also lived there jokingly commented that I should have a Petro and drink an iced tea for her. I thought it would be funny to actually do that. Well, minus the Petro. What I actually did before this picture was meet some high school classmates for dinner at The Cheesecake Factory. (Petros are good, but they can’t hold a candle to The Cheesecake Factory) I think it’s a gift from God that we have friends in our lives like the ones I met that night – we hadn’t seen each other in many, many years, yet we picked up the threads of our relationship right where we left off. I’ve got to say I was a little embarrassed that I was so concerned with how I looked in a picture that I didn’t realize what I was doing, even though no one saw me. It felt vain. But I think being a little red-faced is good for me once in a while. It keeps me humble. I did drink the tea and while I used to love it when I lived there, I didn’t enjoy it as much as I thought I would. In fact, this is going to sound totally weird, but some spice they use reminds me of the smell of the cat litter we use at our house. (Clean, of course.) Every sip reminded me of cleaning out the litter box. That doesn’t make for a pleasant thirst-quenching experience. And then I got to make the three hour drive back home. Through the mountains. In the dark. And the intermittent rain. All wet. The discomfort of wearing wet clothes making me even more uncomfortable mentally, as I wondered if I’m putting too much effort into how I appear to others. I’m still wondering about that. Today I’m linking up with http://onegirl-itjusttakesone.blogspot.com/ for her awesome new link up Chasing History, where some nifty writers each choose a woman in the Bible and blog about her. Apparently I have an affinity for those nameless women who merited only a passing mention in the Bible because today I have chosen yet another of them to write about. Her story is found in Mark 5:25-34. Have you ever been desperate? You’ve done everything you can do to fix things, and the situation has only gotten worse. You’ve spent every penny you can searching for relief, and now you’re broke on top of everything else. The woman in these verses is often called the “woman with the issue of blood”. She had a name, but her name wasn’t important enough to make the pages of the Bible. The story of her encounter with Jesus was what mattered. Jesus has been traveling with his disciples and teaching them what they need to know, and performing miracles along the way. At the beginning of chapter 5 He healed a man possessed by demons, and this woman’s very brief story opens as Jairus comes to ask Jesus to heal his dying daughter. On the way to Jairus’ house a large crowd gathers to follow Jesus, and in the crowd is a woman who has been bleeding for twelve years. (In the South we call that “female trouble”) She’s spent all her money on doctors and treatment and her condition is worse now than when it started. She’s desperate for relief. Think about it: twelve years of bleeding. She’s heard of this Jesus and His miracles, and maybe the flame of hope begins to flicker inside her heart once again. So she leaves her house, where she has likely been confined for the better part of twelve years, and she joins this crowd following Jesus like He’s a rock star. Maybe she’s hoping she won’t see anyone she knows because by this time, by twelve years later, all her neighbors know about her little problem. But she’s desperate, so it’s worth taking the chance. She comes up behind Jesus in the crowd, not brave enough to get in His path and face him. All she’s trying to do is touch His clothes, because she believes that just a brush of His robes will be enough to heal her. Her faith doesn’t require something big and showy. She’s not even asking to meet her Healer. She doesn’t want recognition or to get in the way, just to slip up behind Him and reach out with her fingertips to the hem of His robe. THIS, just this little bit of Him, will be enough, she thinks. And it is enough. Verse 29 says that “immediately” her bleeding stopped and she realized that she was freed from her suffering. Can you imagine? Twelve years of suffering gone with just one touch! Bam! I suspect that if it were up to her, she would have quietly slipped away from the crowd and back to her home, where she could rejoice and marvel at this miraculous healing. Maybe she would have told those closest to her about it and word of Jesus’ message would have been spread to a few more people. But it was not to be, because Jesus – remember, nothing was a surprise to Him – knew she was coming and He had a bigger plan. He knew her story, He knew what she planned to do, and He felt the power go out from Himself when she touched His robe. So He asks, “Who touched me?” Now, you and I know He knew perfectly well who touched Him. But I think Jesus wanted everyone else to know about this woman’s story and about her faith. The kind of faith that didn’t ask for an audience, or a big production, or even a face-to-face encounter. Faith that doesn’t ask for much but the barest of touches. Faith born of desperation. And she knows that He knows so she comes forward, trembling in fear and falling at His feet, to tell Him and the crowd the whole story, as if He doesn’t already know. And maybe she’s wondering if she’s in trouble, if He’s going to rebuke her for touching Him, since her condition has almost certainly earned her the label “unclean”. But instead what she gets is confirmation. Twelve long years. That’s as long as my middle daughter has been alive. That woman must have despaired, must have thought she would suffer the rest of her life, however long that was to be. Hopeless, until she heard about Jesus and took a desperate step of faith. I wonder what her life was like after that day. I know that sometimes we tend to identify ourselves by our flaws and sicknesses in the same way that we often refer to her as the “woman with the issue of blood”. We’re consumed with our problems and finding a way out, and that becomes a barrier to real relationship with Christ. I know that we can use our brokenness as an excuse for not following more closely after God. And then once we’re healed we no longer have that excuse to hide behind and it can be scary to lose a big chunk of your identity, albeit one you really didn’t want to keep. There is some safety in the familiar, even when it involves suffering. I think I could do a blog post just on that subject. But here’s what I want to leave you with: you cannot encounter Jesus and walk away unchanged. Even touching the hem of His robe was enough to heal a woman who had been suffering for twelve years. Jesus wanted the crowd to know that it wasn’t the touching of His clothing that healed her, it was her faith in Him. She believed that even a little bit of Jesus would be enough to stop her pain and it was. You cannot encounter Jesus to any degree and walk away unchanged. Even a little bit of Him is more than enough to do miracles, to rearrange our most miserable situation, to set life on its head, if you believe.